Last week I recorded the first "Blue Box: Special Edition" interview that I have recorded in several years... and so I just wanted to give anyone reading the heads-up that a new episode may be appearing in your RSS feed soon - after a 3.5 year hiatus! 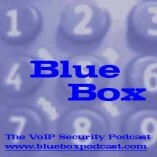 :-) We're not bringing back the full show... yet, anyway... but I have a couple of interviews relating to VoIP security that I'm going to run through the Blue Box podcast feed. I hope you enjoy them... and if you have ideas for interviews you think I should consider, please feel free to send me email (although be warned I don't check it all that regularly so a response may be a bit delayed). For those of you who may be used to reading this blog through the "Security Bloggers Network" set up originally by Alan Shimel, you need to be aware that the "SBN" is going through a transition. As Alan details on his blog, Google is in the process of shutting down the "Network" feature of Feedburner and as a result the page and feed for the SBN will be going away. Alan is working on a new solution but in the meantime you may want to grab the OPML file for the Security Bloggers Network (you should then be able to import this into most feed readers). There are a lot of great security blogs out there. Stay tuned for more information - once Alan has another solution in place I'll post an update. It looks like FeedBurner finally refreshed its DNS info and the RSS feed is back in action. My apologies for the interruption. Please do let me know if there is anything else strange going on with the website or feed. Thanks. Ah, the joys of switching domain name providers. I transferred blueboxpodcast.com from one registrar to another last week shortly before the domain name was set to expire. Unfortunately, I made one serious mistake - I didn't check the DNS nameservers for the domain at the new registrar (GoDaddy) to ensure they were pointing to the new nameservers. They weren't... they will still pointing to the old nameservers. As a result, when the domain name expired at the end of the day on Friday, the web site was no longer available and had the message that the domain name had expired. MANY THANKS to the couple of you who contacted me on Saturday to let me know about this! So I fixed the web site yesterday morning so that "www.blueboxpodcast.com" pointed over to TypePad, where I host this site, and that all seems to be back in action. If you type in "blueboxpodcast.com" without the "www", it was going to a generic GoDaddy page but I've set up the forwarding now so that this should now redirect you to www.blueboxpodcast.com once the DNS propagation occurs. Feedburner is not using the updated DNS information. So it appears that I'm waiting for FeedBurner to update its DNS. I've tried all sorts of options in the FeedBurner settings, including the "Resync Feed" but nothing works because it seems that it is unable to get to the new site (because of DNS). I've filed a help request in the FeedBurner Google Group (which appears to be the only way to get help). Hopefully FeedBurner will age out its DNS info soon and the feed will be back in action. What I find strange, though, is that I'm 99% sure that all the DNS records had a TTL of 1 hour (and I'm 100% positive the new ones do). So my question to FeedBurner is - if that is the case, why aren't they respected the TTL settings of the domains? I'll update this post once I have more information. Well, it's been a while. A long while. This summer turned out to be a bit crazier than Jonathan or I ever expected. The good news is that the renovation at my home is finally done and I've moved into my home office. The box of podcasting gear has come up from the basement. I'm not traveling for several weeks... so everything looks good to finally get the huge queue of back episodes out the door. Thanks for your patience and continued interest in the show. We have very definitely not "podfaded"... and we'll be back with more shows and interviews in the weeks and months ahead! Thanks for continuing to listen.